Everyone will agree that dogs, just like humans, need a comfortable place to sleep in or just to rest its tired body on rather than lie on the cold pavement. While almost any other commercially available doggie bed will do, if you’ve got a destructive chewer in your hands, it will simply tear the bed apart. What you need is an indestructible dog bed. These doggie beds will be very difficult to destroy, even by the toughest and meanest chewers in the canine kingdom. Let us take a look at your options for the best indestructible dog bed. There’s no denying Gale Pacific’s Coolaroo Elevated Pet Bed with Knitted Fabric inclusion in this list of the best indestructible dog beds. For starters the knitted fabric is actually made of high density polyethylene fibers that allows for exceptional strength and durability while affording your pooch freedom from hot spots. The powder coated steel frame will also resist the chewing force of tenacious chewers. And since there are no protruding segments on the panel itself, you can bet your pooch will have a more difficult time looking for something to latch its jaws on. The elevated platform also gives maximum comfort for your canine friend. It’s washable, easy to maintain, and highly resistant against many of your pet’s natural enemies. And for just a little over $20 for its large size, what more can you ask for? 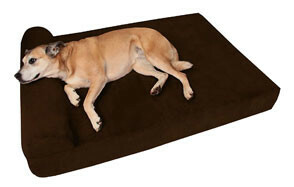 While it is not really indestructible in the strictest sense of the word, you can say that the Brindle Soft Memory Foam Dog Bed is a chew-resistant doggie bed that offers the added benefit of caring for your elderly dog’s aching joints. It’s exceptional for sick pooches as well. Brindle uses shredded memory foam instead of a single solid block supposedly to improve the support afforded to the joints. A zipper closure remains hidden under a panel of microsuede flap. The microsuede fabric has a certain level of strength that you don’t see in cotton fabrics. This is what makes it chew-resistant. While the Brindle is priced almost twice as the Coolaroo for the same size of doggie bed, you have at least 3 years to put the Brindle to the test. One of the things that you will find surprising about the Kuranda Chewproof Indoor Dog Bed is that the mesh fabric panel is inserted right through the structural frame. Conventional elevated doggie beds have the edges of fabric panels wrapped around the tubular frame, giving dogs the chance to bite onto a trailing edge and begin chewing from there. Additionally, the Kuranda comes with heavy-duty PVC materials as its choice of frame which is sturdy and chewproof enough for light to moderate chewers. However, as Kuranda recommends, if you’ve got a real heavyweight chewer, then getting their aluminum-framed dog bed is a must. Another amazing thing about the Kuranda is that it comes with Cordura fabric panels. Cordura is a synthetic fabric that is known for its durability, strength, and resilience. This adds to the Kuranda’s chewproof capabilities. Just get ready to shell out about 4 times the price of the Coolaroo, however. The K&H Pet Products Original Pet Cot is a trendier option for those who seek a sturdy and almost indestructible bed for their pet dogs. It comes with 600D fabric complete with exceptional waterproofing, making it great for the outdoors. It is also priced reasonably fair, just a little higher than the Coolaroo. But it does have one thing going for it. The K&H comes with a beautiful two-tone design with the center panel composed of breathable mesh and a rather wide perimeter band that gives it additional strength. Like all elevated platforms in this list, the K&H allows for more cooling comfort for your pet while minimizing, if not eliminating, surfaces that may be chewed upon by your pooch. AmazonBasics’ entry into the best indestructible dog bed is not really surprising since the e-commerce platform has been steadily diversifying its products. Amazon’s Elevated Cooling Pet Bed comes with all the features that you can see from similarly designed products. It is slightly more affordable than Coolaroo and comes with almost the same specifications, making it a very viable alternative to those who would like to save a couple of dollars more. This AmazonBasics doggie bed is easy to clean and even easier to setup. It’s fully portable too so you can conveniently bring it in your travels. 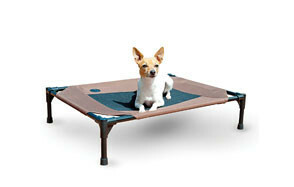 This way you’ll be enjoying more of your pet’s company while also affording it a chew-proof and comfy bed to rest on. What separates 2PET from other brands that make the same elevated doggie bed design is that the manufacturer purposely made its fabric sleeping panel to be fully interchangeable. Available in black, red, and blue, you can easily change the panels according to your preferences. Of course, purchasing the 2PET Deluxe Cooling Elevated Pet Cot will give you only one color, so you’ll have to purchase the other two. The 2PET system comes with 600D Oxford fabric for optimum cooling comfort while its sturdy frame ensures near indestructibility. If any, you can always try the 2PET for a good 30 days first before deciding to keep it or to ask for a full refund. Pawhut’s Elevated Dog Pet Cot is a pretty straightforward doggie bed that shares almost the same features with the other brands of elevated doggie cots in this list. We did try to identify any distinguishing feature that will clearly set it apart from the rest of the pack. But given that we have seen it all, there really isn’t much to be excited about the Pawhut except that if you’re a fan of blue or pink, then it would really be a great option for you. However, considering that the Pawhut is priced slightly higher than other similar systems like Coolaroo, we’re not really sure if it makes for a great alternative. If you want a really tough, chew-proof, and comfortable mattress for your pooch, you might want the K9 Ballistics Original TUFF Dog Bed. It is not really an elevated doggie bed but it sure is tough. The inside is filled with moisture-resistant and air cooling poly fiber fill then covered with a 3D breathable air mesh liner that allows for optimum comfort for your pooch. Next the TUFF is wrapped in rip stop ballistic fabric that helps give this doggie bed its amazing 4/5 chew-proof rating. The rip stop ballistic fabric is resistant to punctures, bites, scratches, tears. And even if your pooch manages to cut through the fabric, the tear won’t grow because of its unique rip stop design. It’s resistant against odors and dirt, too. The only downside to the K9 Ballistics TUFF is that it will cost you 6 to 7 times the price of Coolaroo. But, given that it comes with a 3-month chew proof guarantee, then you can always give it a try. Dogbed4less’ Orthopedic Memory Foam Dog Bed deserves a spot in our list because it offers a surprising level of durability and strength against light to moderate chewers. It also provides an added benefit for those pooches that may have problems with their muscles, bones, and joints. The Dogbed4less comes with gel-infused memory foam that gives it an amazing density that is 5 times greater than ordinary foam beds. Enveloping the memory foam is taffeta fabric that serves as the Dogbed4less’ internal defense against punctures and tears. An outer denim cotton cover is a bonus since this is known to be stronger and more chew-resistant than conventional fabrics. We are not just sure if these features are enough to justify its hefty price tag, although it’s half the price of TUFF. Big Barker’s 7-Inch Orthopedic Dog Bed with Pillow Top is a true class act. A 3-inch H45 support foam is sandwiched by two 2-inch H10 comfort foams and then enveloped in an extra-durable microfiber cover. This is what makes the Big Barker truly special. And honestly, a lot of folks believe them. Otherwise, they will not back up their claims with a 10-year warranty if they are not sure if it will stand up to the test of time. Each Big Barker is carefully made by hand using foam that is CertiPUR-US-certified durable. In fact, Big Barker says that its doggie bed should still retain 90% of its original support and shape after 10 years. Now that is huge since it virtually means the Big Barker will last the entire lifetime of your pooch. Be ready with your wallet though as Big Barker is mighty expensive. Choosing a really durable bed means having the right assessment skills to determine an indestructible bed from one that is merely implying that it is durable. While it is definitely a lot easier said than done, there are some things you can do to arrive at the best indestructible doggie bed. You can start with this buying guide we prepared just for you. What is an Indestructible Dog Bed? Doggie beds are designed, for the most part, for optimum comfort. That is why you would want a material that is soft and smooth and can provide ample support for the various bony prominences in your pooch’s body. Unfortunately, we also know that conventionally soft doggie beds are not really that resistant to the bite force of tenacious chewers. As such, they get easily torn, gaping holes cut through them, and, in time, will be shredded to pieces. Any dog bed that can withstand the chewing habits of your dog a lot better than conventional doggie beds can be classified, albeit rather loosely, as indestructible. We said ‘loosely’ because the definition of ‘indestructible’ can be as varied as the opinions of countless dog owners. For some, as long as the contraption is more durable – retains its shape a lot longer than traditional beds – then it is already an indestructible dog bed for them. Others will look for materials that are very difficult to chew on such as metal elements. True, metal can still have scratch marks on its surface but the relative hardness of the material makes it tougher than the teeth of any pooch. So, your idea of an indestructible dog bed may be different from the one in the mind of a friend or even a neighbor. But, generally, here’s the thing. If a doggie mattress or cot possesses certain characteristics that allow it to stand the test of time and your dog’s chewing behavior, then it can be rightfully classified as an indestructible dog bed. Which Dogs Need an Indestructible Dog Bed? As you may have already guessed, if you have a pooch that is a mighty chewer or even an overweight canine, you might want to get a more durable bed for them. Puppies are tenacious when it comes to chewing so it is often a good idea to get a mattress that is sufficiently tougher than most. If you were able to train your puppies to tame their chewing tendencies, you can go back to a standard doggie mattress once they grow up. However, if their chewing tendencies happen to turn destructive, then you should consider getting a really tough and durable bed. The same is true for pooches that are overweight. Body weight can easily compress the fill in these mattresses. As such, if you don’t get something more durable, you’re essentially looking at buying several mattresses over a period of a couple of years. Picking the right bed for your dog is easy. 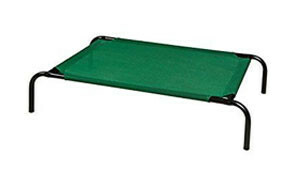 However, to determine if you really need an indestructible dog bed or not you may want to consider the following. As we have already said, the chewing behavior of your pooch has to be one of the most significant factors for consideration. If you have a really aggressive chewer at home, then it is a must that you get only the toughest and the most durable types of doggie beds. Your best option will be to get elevated or raised dog beds as these typically come with metal frames, although it is not uncommon to see others using other materials such as PVC. Since the sleeping platform only includes a panel of fabric, then there really isn’t much to chew on, except perhaps the legs and frame of the doggie bed. Owing to the nature of the materials of the frame, it will be almost next to impossible to completely destroy it; unless, of course, you have a frame that is made up of cardboard, which we have yet to see. If you have a moderate chewer, then doggie beds that are made of certain durable materials like ballistic nylon and canvas should be your choice. These materials can provide you with the peace of mind that your doggie bed will not be shredded to smithereens anytime soon. If your pooch is a passive chewer, then rejoice as there really isn’t any ordinary doggie bed that will not be suitable for your dog. We had to include this as a major consideration since we’re essentially talking about your dog’s chewing behavior. If it is trainable, then we strongly recommend addressing its chewing behavior with sensible training first. Then you can start thinking about getting an ordinary doggie mattress. However, if your pet is simply not the breed that listens to you or is very stubborn, then an indestructible doggie bed is needed. If you’re getting a doggie mattress, nothing beats double stitching of the seams. This gives you improved durability than single stitched products. Also, you might need to consider the thickness and the type of foam filling as there are those made of flimsy material. Your best bet will be those that are certified to be highly durable. If you’re getting a cot, you might need to consider the joints. Additionally, if the frame is to be assembled, then the integrity of the structure should be maintained by a mechanism. If not, you’re looking at potentially injuring your pet should the frame give in to your dog’s weight. In our list, we have shared doggie beds that are as inexpensive as a couple of tens of dollars to a few hundred dollars. Your choice actually depends on how much you’re willing to spend on a doggie bed. We’ve been talking about indestructible dog beds. We know what you have in mind – the materials that will best fit this description. As such, we’re providing you with 3 of the most common materials used in either sleeping panels in elevated doggie cots or outer covering of conventional doggie mattresses. Ballistic nylon – This provides the best material when it comes to chew-proofing your mattress. Dogs are not really fond of chewing on nylon perhaps because of its ‘slippery’ nature. And even if you do have a dog that will chew on nylon, the fabric will be so tough that your pooch will take several years of chewing before it will make a dent on the fabric. Canvas – Most dogs are also averse to chewing on canvas. We’re not exactly sure why but all of our dogs simply don’t like chewing on these types of materials. While it is not as tough as ballistic nylon, just the mere fact that your dog will avoid chewing on canvas is enough to get it as a durable dog mattress. Denim – Unless you gave your pooch a denim toy when it was still a puppy, there is a big chance that a dog bed made of denim will survive many years since your pooch will not be gnawing on this material. It is structurally weaker than ballistic nylon and canvas, however. Nevertheless, since most dogs are not really fond of chewing on denim materials, this should help extend the lifespan of your denim-covered doggie bed. If you have a pooch that doesn’t really chew on things then you only need to give your pooch an ordinary canine mattress. However, if you’ve got a mighty chewer in the household, these indestructible dog beds we featured here should help you choose the best one.